Chilli Paneer has to be one of my most favourite Indian food starters – it tastes absolutely delicious and is super easy to make. It is also one of the quickest starters you can whip up if you need to make something in a hurry. It is also served as an accompaniment to a main meal sometimes, and also has gravy, but I prefer my chilli paneer as a starter and dry. This makes for a delicious starter or a light bite to eat as a snack. Feel free to vary the spice levels in the recipe – a chilli paneer is best made to your taste. Vary the level of spice by changing the proportion of the green chillies in the recipe. The sauce does need to be a little spicy to add flavour to the dish, otherwise the paneer tastes bland. I do however recommend adding the spring onions on top as a garnish as it adds a touch of freshness to the taste. As a variation of the original recipe, you can also directly fry the paneer cubes instead of coating them with the cornflour. 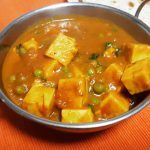 Frying the cubes directly brings out the flavour of the paneer better and is a slightly lighter variation to the recipe here. But I’ve had mixed reactions to this variation, so please try this on a smaller batch if it works for you. If you want a vegan version, simply substitute the paneer with firm tofu, and keep everything else exactly the same. You can also use the same recipe and substitute the paneer with cauliflower to make Gobi chilli – equally delicious! Make sure that the gobi is cut into smaller chunks and properly fried after being coated with the paste. I normally serve the paneer chilli with a limited number of dipping sauces – including a tamarind chutney and a green chutney. These are good for guests to vary the level of spice as per their tastes and preferences! This is a dish with a preparation time below 30 minutes so it is important that you have all of the ingredients ready to use and handy. The chilli, garlic, onions and peppers are meant to be cooked on high flame wok style, this is so that they stay crunchy. Therefore it is important that you keep the garlic in big pieces for it nor to burn. The paneer will get all its flavour from the sauce, this one should be packed with flavour, but bear in mind that the soya has already a salty taste so make sure to keep tasting and adjusting the seasoning. 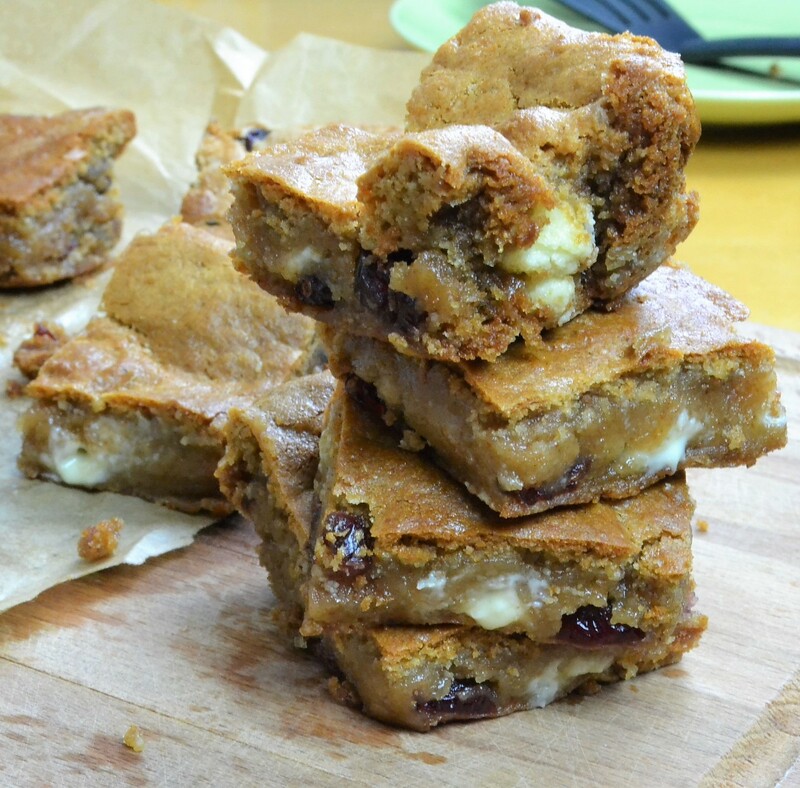 As always, I’d love to read your thoughts on the recipe and any thoughts from you having tried the process! In a large bowl mix 1 tbsp of cornflour, salt and the chilli powder, add the paneer and toss to coat it with this mixture, transfer to a metal sieve and shake to remove excess of flour. Heat up a pan with oil just enough to shallow fry the paneer, fry until golden then keep aside in a kitchen paper lined tray. Heat up a pan with oil on high flame add garlic, onions, peppers and chilli, fry until golden then add both soy sauce and ketchup and stir. Make a slurry with 0.5 tbsp of cornflour and water and add to the pan, check seasoning. Add back the paneer to the pan and toss to coat, Serve immediately with freshly chopped coriander and spring onions. 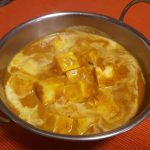 Looking for other Paneer Recipes?